I do recommend the first and longer option, as you will get to see much more and experience the "other half" of Cuba - Santiago. 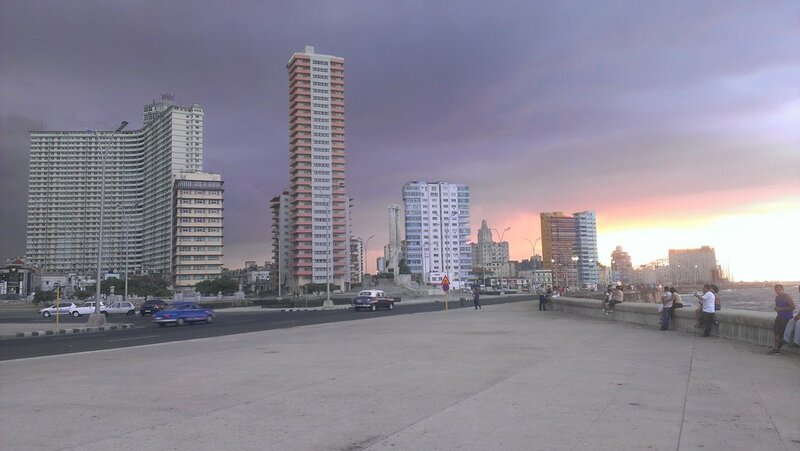 However, if your schedule simply does not allow you to be gone for two weeks, then I do recommend coming with us to see Havana, where we will still have an extremely good view of Cuba and its music & dance culture. We will fly to Santiago on Sunday, November 27th. Or, we may instead take a road-trip to Santiago which will involve 1 or 2 nights spent in interesting locations between Havana and Santiago. There is only one flight per week between Miami and Santiago de Cuba, and it's on Friday. Thus, the return on Friday. (This way you will have a full two days to recover from your trip before getting back to work/life.) We will have to see if there are better flight options come November. If we can, we will stay until Saturday, December 3rd instead. If not, we may depart for Cuba on Thursday, November 17th instead. This trip will be run under a legal people-to-people educational license for travel in Cuba. The group size will be limited to 14 travelers, but may not be more than 9 people. Please note that this will be run as a "boutique" tour, meaning that the group size will kept small, each member of the trip will receive individual attention, and the tour can be somewhat customized to your desires & interests. In addition, we are staying in upscale accommodations, but as a home-stay, not in a hotel. The group will be able to move around more efficiently and do more than a larger group could. This way we can all achieve my goal of making sure that each person has an amazing experience. Full time chauffeur-driven car available for the group everyday & night to take us wherever we need to go. At times we will have a second or third car available to transport the entire group at once. Group dance lessons for 3 hours per day for 8 days. And each student will have his/her own Cuban professional dance assistant/partner during each class. Ten nights out dancing in authentic Cuban nightclubs. This includes going out to the best-known clubs of Havana and Santiago to hear and dance to live famous international acts (such as Los Van Van, Havana De Primera, Pupy y Los Que Son Son, Manolito Simonet, Elito Revé, etc.) of Havana, and the most well-known Son/Salsa bands of Santiago. For about 4 of these 9 live dance concerts we will go out with a group of teachers and professional dancers to the clubs, and you will be able to dance with all of them to practice and enjoy dancing all night long. Visit to rehearsal of a famous salsa band with a private performance and lecture about music. In Santiago, a home-style neighborhood party with a local but internationally known Son/Salsa band. Local specialty food is served for all. At least one afternoon trip to "Playas del Este" -- a 30 minute drive to the most beautiful beaches in the Havana area. Guided tour through Havana for two or more afternoons -- one with a professional English-speaking Cuban guide, and the others with Eric. Guided tour through Santiago for one morning - with a professional English-speaking Cuban guide. Wandering around the streets of Havana and Santiago and encountering live son/salsa bands, and people to speak with. Visit to a couple of Cubans' homes - on both sides of the economic spectrum - and hear them speak on life in Cuba today. If you have a special interest, such as seeing a Cuban school/university, baseball game, tobacco or coffee farm, etc., just ask and we will help to arrange this. For between 4-8 days & nights of our trip, we will have professional photographer with us capturing photos & videos of our activities - walking around Havana, taking dance lessons, visiting various sites, etc., plus anything else you request. Our photographer is a local documentary filmmaker, who will become a part of our group, and who will always be happy to share his perspective on life in Cuba. On our last trip, we ended up with over 800 photos & videos, creating a permanent & special memory of our time there. Photos will be distributed on Flickr.com (or on a USB stick) in full resolution upon returning home. There will be an additional charge for this service of just $5 per day. We will all have to agree how many days we would like the photographer to be with our group. Breakfasts: usually available in your casa/apartment. $5 is the typical price. Can go out for breakfast as well for a similar price. All above mentioned prices are for Havana. For Santiago, prices are generally about one third less. Drinks at clubs: alcohol, etc. The cost of the trip is $3,250 (double occupancy), $3,450 (single occupancy) per person. The price for the Havana only trip is $2,700 (double occupancy), $2,850 (single occupancy). This will be for about 8 days. These prices are per room, not per person. So if you are doing double occupancy, then the additional cost is only half that per person. $1,000 up front to reserve your spot on the trip. Final $500 due upon departure for Cuba. Late fees are $50 per day for any late payment. If you need to cancel for whatever reason, I'm afraid none of the payments are refundable, except for a partial refund if we can find a replacement traveler and transfer the plane tickets into their name. Why travel with Eric "El Cubanito" Freeman? Eric has been traveling to Cuba since 1995. He has traveled there 16 times, and spent a total of 20 months there. He has studied dance there extensively and has developed numerous connections over the years. Join him to explore and experience the amazing things Cuba has to offer. The focus of the trip will be dancing and music, but the tour includes exploring Cuba's history, architecture, beaches, and their fascinating people. Please simply fill in here, and email me back. 2. Do you have Facebook? We tend to use Facebook for group communications (mostly before the trip), but this is not at all required. 3. Fill in the info below from the ID you will use to board the domestic flight to Tampa/Miami. Simplest would be as it appears on your passport. Otherwise, the info as it appears on your Driver's License. 6. I need to know if you have any physical and/or psychological issues that could impede your ability to successfully participate in this trip. 7. Understand that this tour will involve walking at a moderate pace of up to 1-3 miles per day. This will be in, depending on the weather, fairly hot, humid conditions. In addition, we will be doing (on about 8 days) 2 to 3 hours a day of dance lessons in well-ventilated, but non-airconditioned rooms. In most evenings we will be going out dancing for 2-3 hours. All activities are optional. If you are tired at any point, you can always opt-out and go home to relax, rest, etc. 9. What are your expectations for participating in this trip?